Alongside his practice as an artist and art-historian, Nigel Lendon has been an inveterate and purposeful collector of, amongst other things, conceptual art, Afghan War rugs and over 200 plastic cameras. In the 1970s and ‘80s Lendon was interested in the intersections of high culture and mass communication. He discovered flea markets swamped with plastic artefacts discarded by previous generations and asked, how was it that plastic, once heralded as the “material of the future”, so rapidly fell out of fashion to become cheap and ‘nasty’? Lendon’s plastic camera collection has remained cocooned in storage until now. It has have emerged when plastic and the waste it generates is now regarded as a new challenge for the survival of life on the planet. 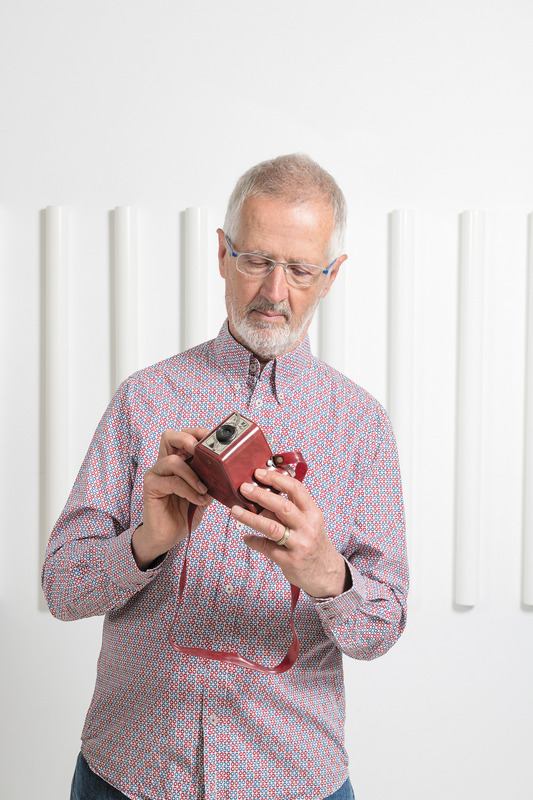 Nigel Lendon with one of the over 200 plastic cameras he has collected.